It just doesn’t seem possible that I have almost everything I need to make the NPOTA activation today in this pittle pack. I am planning to activate the Carl Sandburg Home (NS07) for National Parks on the Air today. I should start sometime between UPDATE (17:00-18:00) UTC and operating for about one hour. I’ll be SSB/QRP on 14286 and possibly 7286 kHz (depending on the type of antenna I can deploy). I’m fitting this activation into a busy day, but will do my best to hit the air and work as many stations as possible. I just finished packing everything for the activation. 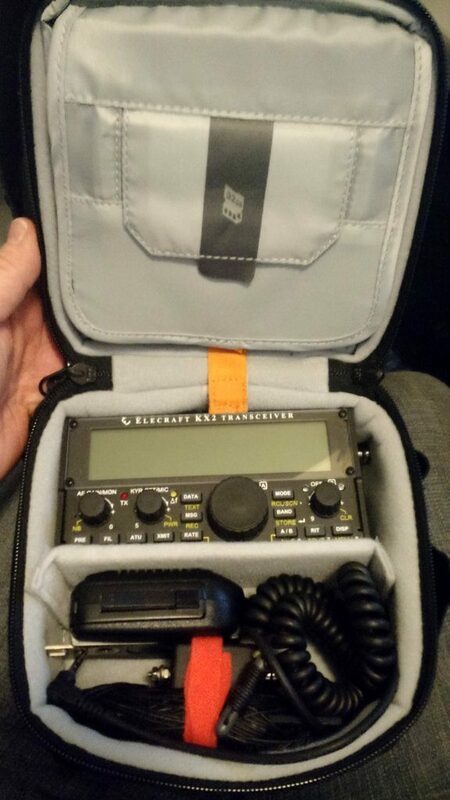 This will be the first time taking my Elecraft KX2 to the field. It feels *very* strange not to pack even an external battery. Just the little radio, an antenna, a clipboard, an assortment of adapters and a short run of coax. Not sure yet if I’ll hang the Par EFT trail-friendly antenna or use my telescoping fiberglass vertical (which performed admirably last week!). This is a sensitive archeological site, so I have to abide by the wishes of the park ranger on duty (though I’ve been given permission to install the vertical near their vegetable garden). I want to hang the EFT so I’ll have two bands (20 and 40) at my disposal. If you have the time today, please try to work my station! This entry was posted in Portable and tagged Elecraft KX2, National Parks On The Air, NPOTA, QRP. Bookmark the permalink.